Friday August 19th 1881 I worked about the house all the forenoon. Bridget did a large washing. Mother came home in the forenoon and had only just got here when Aunt Ellen came. I went over to Hatts in the afternoon and stopped at Wins. Was very tired and went to bed early. Saturday August 20th 1881 We got an early start to Helmichs this morning. Win got over just as we were ready to start. We had a splendid day and got there by seven oclock. found the folks well and spent the evening very pleasantly. 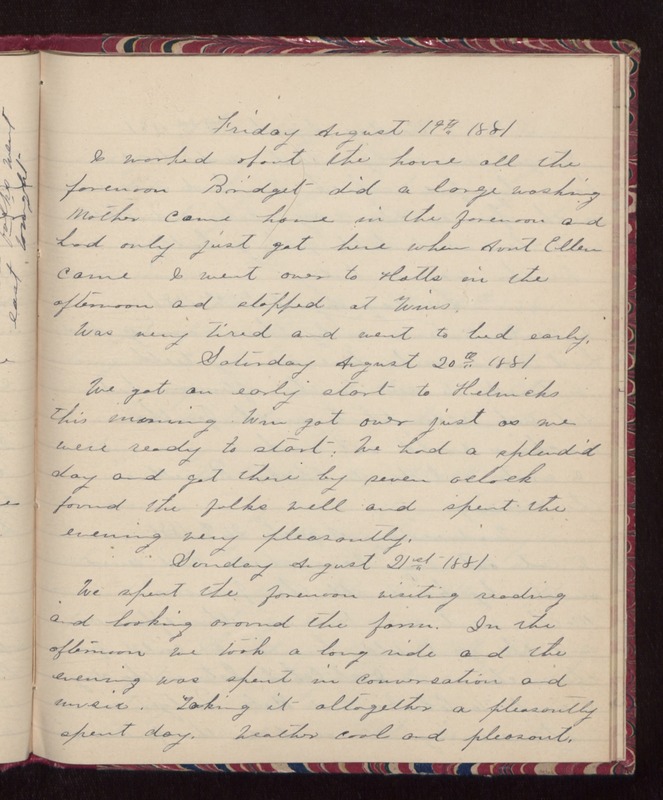 Sunday August 21st 1881 We spent the forenoon visiting, reading, and looking around the farm. In the afternoon we took a long ride and the evening was spent in conversation and music. Taking it altogether a pleasantly spent day. Weather cool and pleasant.